The Rene Pierre is a French pool and foosball manufacturer that is known for making elegant tables that follow the European style of play. They offer a variety of models at varying price points from tournament, to coin-op bar, to home use models. European tables are centered around ball control, finesse, and pin shots as opposed to the American power and speed play. Rene Pierre makes high quality tables that feature the ability to have skilled ball control that allows you to truly feel control over the table, as opposed to the aggressive American style of play. Rene Pierre is a French owned and operated company that primarily makes high-end modes. They do have a few home versions geared towards kids such as the Foot, Goal, and Club models. 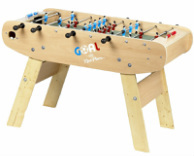 Even the entry-level Rene Pierre table is made with top-notch parts and targets skilled foosball players. Due to this, their tables are in the higher price point, but they are well worth the investment if you are a serious player.